Winnipeg is a city whose early existence relied heavily upon river traffic. Today the rivers are somewhat forgotten in the early morning bustle of rush hour traffic. Passing almost unnoticed, under the very bridges you cross everyday; three lovely steel ladies carry on their proud tradition. They remind us of a simpler age when theirs was the predominant means of travel. I am of course referring to our city’s riverboats. The first riverboat to arrive in our city was the Anson Northup on 10 June 1859 from St. Paul, Minnesota. It landed at the site of present day Kildonan Park. This ship was named and operated by U.S. businessman Anson Northup. The first shipment of wheat was transported by the steamer Minnesota on 21 October 1876 from what is now Lombard Avenue eventually arriving in Moorehead and then by rail to Toronto. 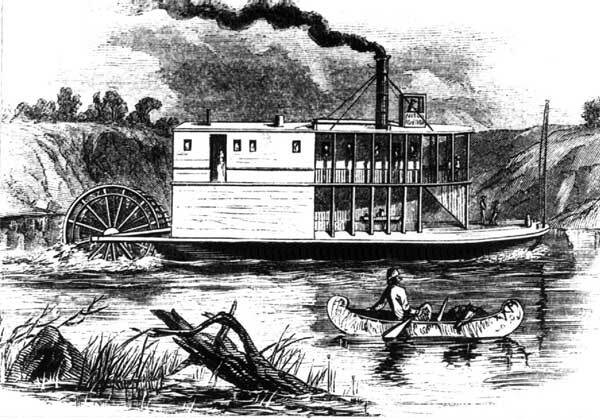 Of course, the arrival of the steam engine Countess of Dufferin to Winnipeg was made possible by the sternwheeler S.S. Selkirk on 9 October 1877. The steam engine heralded the beginning of the end of riverboats hauling cargo and these ships soon became more reliant on passenger service as a source of income. The first riverboat in Manitoba, the Anson Northup, arrived in the Red River Settlement from St. Paul, Minnesota in June of 1859. With the arrival of the steamer S.S. Keenora in 1917 a new era for the riverboat began. 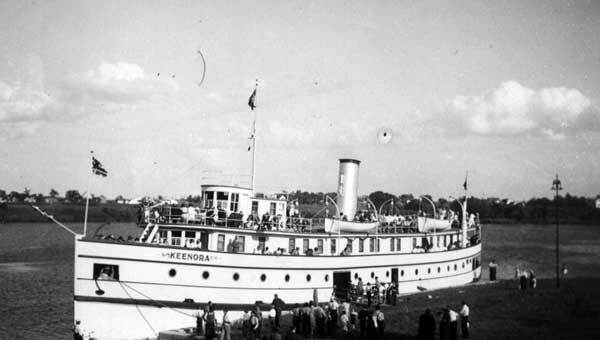 The Keenora transported passengers and cargo from Winnipeg to various points along the shores of Lake Winnipeg. For many years this vessel served faithfully until finally in 1965 it was decommissioned. The S. S. Keenora transported passenger and cargo between Winnipeg and communities along the shores of Lake Winnipeg from 1917 until its decommissioning in 1965. 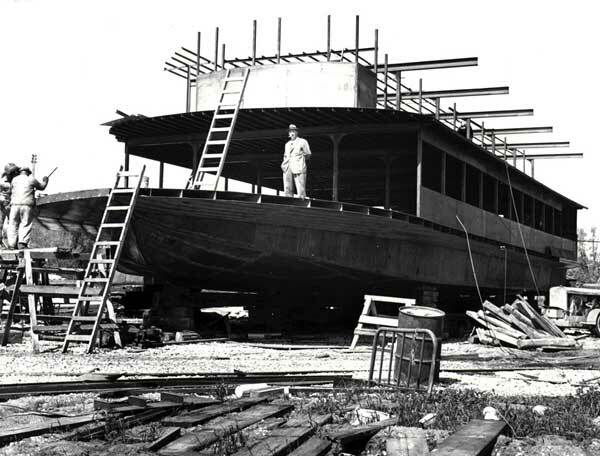 In that same year, only two years before our nation’s centennial, two visionaries would begin to create a re-birth of the riverboat experience, 106 years after the arrival of the first to our city. Ray Senft, who was the former owner of Red River Construction, while on holiday in Mexico, was inspired by the Mississippi style riverboats that operated there. He decided to build his very own replica sternwheeler for use in Winnipeg. In the early part of 1965 Senft and a team of labourers constructed the M.S. Paddlewheel Queen in only 80 days. Costing $200,000, it was a remarkable feat of construction to this day. The Queen was launched in Selkirk, Manitoba in late June 1965. At first the ship was only 90 feet long and 32 feet wide but due to overwhelming popularity it was extended to 145 feet in length with the addition of a third deck. This increased its weight to 400 tons (This deck was removed in 1989 to facilitate navigation downtown). The Queen’s maiden voyage was 29 July 1965 for a dinner and dance cruise. 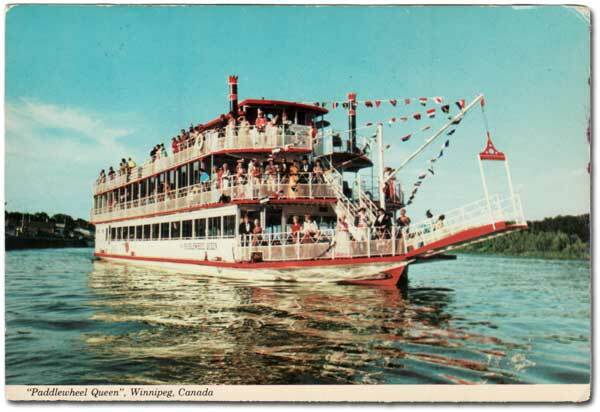 Postcard of the Paddlewheel Queen on the Red River, no date. In 1966, Mr. Senft decided to build a second smaller sister ship to alleviate the overbooked Queen. By July of that same year the Princess would be operational. The M.S. Paddlewheel Princess measured 90 feet long with a 32-foot beam weighing 200 tons. At first she was constructed with only a single enclosed deck, but a second was added shortly thereafter. Both ships were then operating from the Redwood dock. The Paddlewheel Queen under construction in 1965. Built by entrepreneur Ray Senft, the Paddlewheel Queen was constructed in only 80 days at a cost of $200,000. With the arrival of the 1967 navigation season a new ship would create a rivalry that would span some 27 years. Dan Ritchie former owner of the Millionaire Drive-Ins decided to construct his own riverboat to cash-in on the growing market for this service. He approached Purvis Shipyards (who had previously built the other two vessels) and asked for a modern, sleek looking river cruiser. What emerged from the blueprints became another Winnipeg landmark, the M.S. River Rouge. She was built for the then princely cost of $500,000 dollars, weighed 286 tons and measured 125 feet long and 32 feet wide. The River Rouge would be lengthened and refitted in years to come. Today it is 150 feet in length and weighs 500 tons. The Rouge would be followed by a sister ship to compete against the Princess for excursions to Lower Fort Garry National Historic Site. Construction started on the M.S. Lady Winnipeg in 1971 and was completed by spring of 1972. She was 80 feet long with a 17-foot beam. The vessel had one enclosed deck with a second open-air deck for sightseeing. The name was suggested by Mayor Stephen Juba who was a friend of Commodore Ritchie’s. The ship itself was in fact christened at the 312 Nairn Ave. dock by Mrs. Juba. This ship would later be extended 36 feet in 1974. 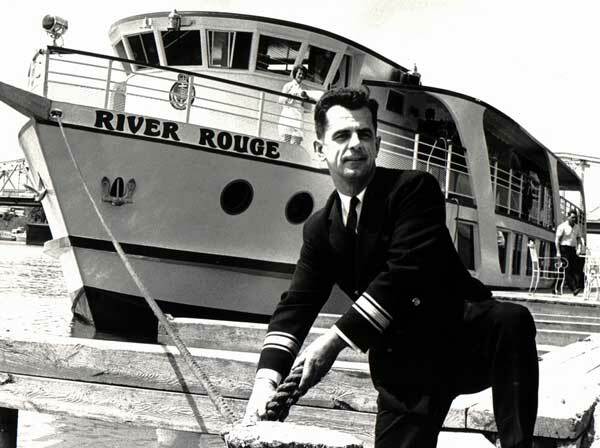 Captain Ritchie tying up the River Rouge, 1967. From 1967 to 1993 a strong rivalry formed between the two companies each one trying to out perform the other in service, price, selection of food and schedules. When both companies purchased double-decker buses for sightseeing, it is rumoured that the bus drivers would entice the competition’s passengers to board their bus with the offer of free tickets or preferential treatment. Price wars were commonplace. Some staff has even suggested that they were recruited by their rival to work for them at a higher wage. To say the least these were very successful and equally humorous times. Finally who could forget the ship that would be the largest in Western Canada for many years; the ship of dreams, the lady of the lake, the now sadly desolate M.S. Lord Selkirk II. You may argue with this author that the Lord Selkirk is not a riverboat and you would be half right. Only in the mid 1980s would the ship be confined to our rivers. After the Keenora was retired from service in 1965 the general public demanded that a new ship succeed her presence on the lake. Letters poured into local papers expressing the need for another ship, Dr. Kenneth McKenzie answered the call. He and several associates formed Lake Winnipeg Navigation Ltd. to raise $1.5 million dollars to build a new ship. Construction began in fall of 1967 and with very few setbacks was launched in 1969. Dr. McKenzie grew up in Selkirk and regularly, as most residents do, became familiar with the presence of lake boats for most of his life. He believed that leaving the lake without a pleasure cruiser was significantly ignoring its potential. On 9 June 1969 the M.S. Lord Selkirk II was launched in Selkirk. Her spectacular launch created a fair sized wave soaking the hundreds of spectators along the Selkirk Slough. The majestic cruiser was later christened by Mrs. Mitchener, wife of the then Governor General. This vessel would dwarf all other local competitors in size. The Lord Selkirk’s dimensions are 176 feet in length, 41 feet wide, 34.5 feet above water with a draught of 7 ½ feet (Most of the riverboats had a draught of only 4 feet). Due to the large operating costs and dwindling passenger numbers by 1978 the Lord Selkirk II was sold by Venture Manitoba to Sub Arctic Expeditions. They in turn suffered financial difficulty and decided to sell. By 1983 the Lord Selkirk was bought by Bill Harris and Jim Gauthier who invested over 2 million dollars in modernizing and refitting the vessel. Following the refusal of a casino license and loss of his partner Harris sold the ship in 1986. It was bought by Joe Slogan who operated it as a riverboat as Harris had done, until 1990. That year it was finally determined that the ship was no longer viable as a business and it has been mothballed in Selkirk ever since. The Lord Selkirk II has been the victim of vandalism, theft and of age. It is truly sad to see her in such disarray. The ship is rumoured to be for sale but as yet there are no successful bidders. It would be nice to see the Lord Selkirk one day in the nearby Marine Museum; a much more fitting end to a proud lady than being broken up for scrap. The M.S. River Rouge, 1980. The Lady Winnipeg has not been part of the Winnipeg scene since 1993. After the merger of Paddlewheel Tours and River Rouge Tours there wasn’t enough business to support a fourth ship. The vessel would be mothballed in the Selkirk Slough as many other ships have in the past. There she would lie in wait until 2002 when she was bought and rescued for use as a private yacht and is currently being rebuilt. The continued operation of our city’s riverboats could not have been maintained without the dedication of two prominent individuals; Captain Steve Hawchuk and Captain Alex Cunningham. Steve Hawchuk has owned the Paddlewheel Queen and Princess since 1969 and has operated them for 36 years. 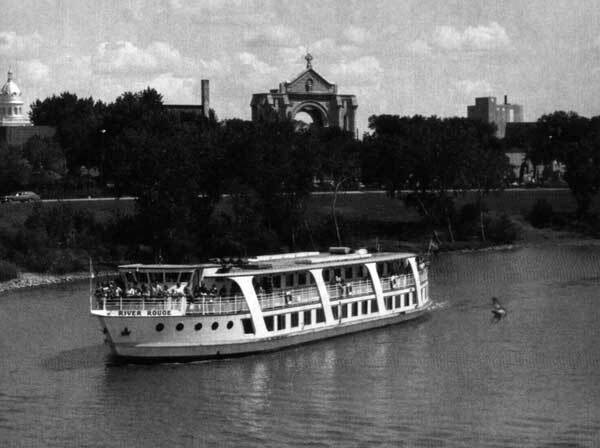 After River Rouge Tours merged with Paddlewheel in 1993 Hawchuk with Captain Cunningham’s help, has also operated the River Rouge. Captain Alex Cunningham who has been Captain of the River Rouge since 1970 has contributed immeasurably to the operation and maintenance of these ships for others to enjoy. In June of 1999 Captain Cunningham was awarded the Lifesaving Society’s 2000 Rescue Commendation for bravery for rescuing a woman who was drowning in the Red River. For those landlubbers who are entranced by the beauty of our city’s rivers, the wildlife along their muddy shores, our rich nautical history or even the prospect of a shipboard romance, they can fulfill their needs aboard the remaining three riverboats. During my six seasons working on these ships it has become abundantly clear that the history of river transportation in this province must be preserved. If you consider the fact that these three ships alone have transported over two million passengers to date, I would say that these ships have touched the lives of countless people. The value of their history is greater than the cost of their hulls or the money kept in the safe. It’s priceless! The innocent love of these ships can be seen on the faces of children waving from shore, smiles of newlyweds and the glimmer in every grandmother’s eye. What better legacy could we leave our city?